It is Yom Ha’atzmaut, or Israeli Independence day, and as I write this fireworks are exploding outside my window. For Israelis this is a major day, something they still remember and actively fight for. Sure the Fourth of July is big in the US, but there’s no one alive who remembers the American Revolution; that’s the stuff of history books. Israel is only 63 years old today. The primary culinary tradition associated with Yom Ha’atzmaut is mangal, or Israeli barbecue (read my recent article on the subject for more info). Tomorrow the streets will be lined with people grilling chicken hearts and kebab on small disposable grills low to the ground. We will be attending a backyard barbecue and our hosts asked us to bring salad because “That is all Americans are good for.” Thanks. Prior to moving here salad meant lettuce with some sliced vegetables. Since living in Israel, my idea of what makes up a salad has completely shifted. It can be cooked tomatoes, grilled eggplant mixed with tahina, or spiced carrots. 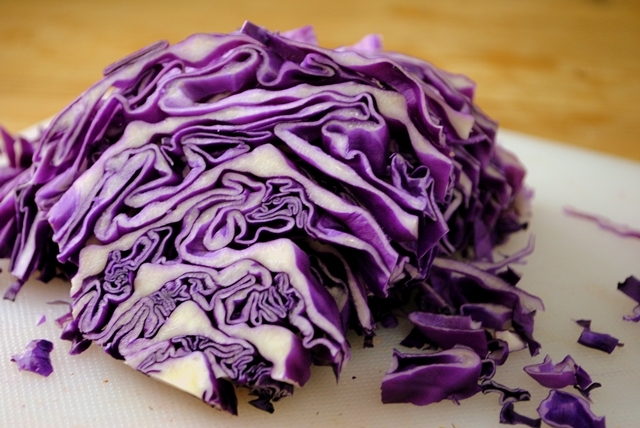 Evan, who loves salad more than anyone I’ve ever met, has been fully converted to cabbage as a base and goes through red cabbage like there’s no tomorrow. Even I have mostly given up on my beloved arugula. Back when the Second Avenue Deli was actually on Second Avenue (it’s now on 33rd and 3rd), we used to go there at least once a year with Evan’s family. The brusque, seasoned waitstaff would immediately bring pickles and health salad to the table before you even had a chance to order your first Dr. Brown’s. Growing up I had a fear (yes, I would call it a fear) of mayonnaise and so never liked coleslaw. In general, cabbage evoked memories of my Chinese upstairs neighbors cooking it in huge quantities and I avoided it whenever possible (honestly, it rarely made an appearance in my Italian-American household). This health salad – simply shredded cabbage mixed with oil and vinegar – was a new phenomenon to me. Still, I respectfully abstained. Again, it wasn’t until moving to Israel that I developed an appreciation for health salad. And suddenly, I couldn’t think of anything better to bring to a barbecue. We didn’t look up a recipe (it didn’t occur to me that they would even exist, but a quick search just now proves they do), but Evan said he was pretty sure you had to let the shredded cabbage sit in the oil and vinegar for a while. 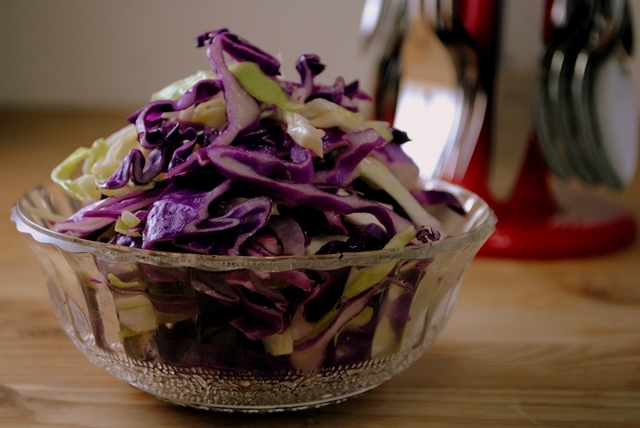 We used red and white cabbage, some onion, olive oil, red wine vinegar, and plenty of salt and pepper. 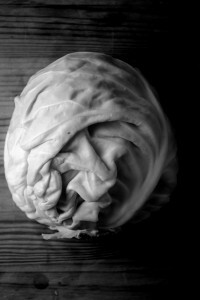 I didn’t want to drench the cabbage, so put less than I originally thought I needed, and it turned out perfect. A light coleslaw-like salad ideal for a hot day, just right to accompany the heavy, plentiful mangal. 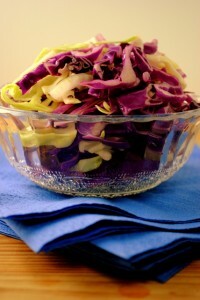 Combine the red and white cabbage and onion in a large bowl. Add the oil and vinegar and toss to fully combine. Season generously with salt and pepper and toss again. Cover and refrigerate for at least 4 hours, preferably overnight. Before serving taste for seasoning and add more vinegar, salt or pepper as needed. And I live just next to a park,which is going to be full of people grillng meat tomorrow,and part of the smoke comes to my flat.A real nightmare for a person that doesn’t eat meat and cannot stand the smell of it. But that salad is good;) Happy Yom HaAtzmaut! It’s true, we’ve been to the new location a few times (now open 24 hours! or was it always?) and it is definitely still delicious.